Provide easier access to the water of a well or an aquifer, while minimising the risks of water contamination and child accidents associated with uncovered wells, through the use of a manually operated pump. 2) Who chiefly use this means and since when ? The pump principle has changed little since its inception, whether for the piston pump invented in 275 BC by Ctesibius, or the rope pump invented in the 1st century BC in China. These pumps were still commonly used in the countryside in the United States and Europe in the 19th century. One pump was usually sufficient to supply a family and its livestock with water. 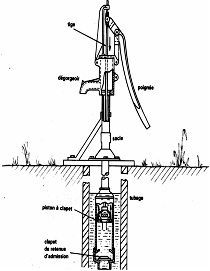 Although this technique fell into disuse with the advent of mechanisation and electrification, it is still widely used in developing countries. It is a relatively inexpensive technology, demanding little complicated maintenance, which can usually be carried out by communities, and which provides access to water that is kept pure and often almost free. In cases where maintenance is neglected, often uninterrupted use of the pump causes premature wear of parts and sometimes irreversible degradation of the mechanism, calling for the pump to be replaced. This explains why the pump is a success in some villages at first and then abandoned a few years later. Indeed, in some countries or regions it has been repeatedly observed that more than a third of wells or boreholes are abandoned after a few years due to an unsuitable choice and/or lack of maintenance, repair facilities or spare parts. This technology is limited by its instantaneous pumping ability. It thus mainly concerns rural and suburban areas not connected to a town sewerage system. There are dozens of models of hand pumps and several ways of classifying them. They are chosen on the basis of their lift height or operating speed, which varies according to the depth and the pump type. - pumps with a high lift height (up to 80, 100 or 120m such as the Monolift, Volanta and India Mark III pumps.). They allow water to be delivered higher than ground level. The capacity of a pressure pump depends on the water pressure in the pump body. In this case, it is the knowledge of the total dynamic head (TDH = Suction height + pressure head proper) that allows, among other things, the required pump type to be chosen. To better understand their characteristics, however, it seems preferable to instead divide them into three broad categories according to the technology used for the "pumping" part : piston, diaphragm or rotor. They can also then be further broken down according to their transmission type : through linkage, cable, chain or hydraulic control, and according to their control system : through lever, handwheel, crank handle or pedal. Finally, various categories of materials are used : iron, steel, stainless steel, PVC, etc. This is, among other things, what often makes the difference in the strength, weight and price of pumps. - its total dynamic head (TDH), equal to the sum of the lift height and its discharge height, excluding head losses. The higher this value, the lower the flow rate. 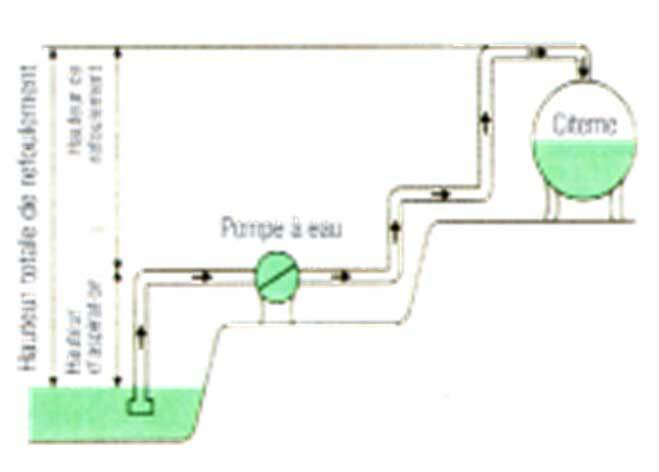 (the lift height, which is theoretically limited to 10.33 m, but in practice is 7 or 8m taking head losses into account, corresponds to the negative pressure required to create suction in a pipe and lift the water). Each pump is characterised by a curve (graph) most often representing its TDH versus its flow rate, which it is best to be aware of before purchasing. The piston pump’s operating principle is slightly different according to whether the pump is in the priming phase or operating phase. The priming phase is the phase during which water is poured into the pump body while the pump arm is actuated to lift the water thereby creating sufficient suction to cause it to rise. When the lever arm is lowered, the rod to which the piston is attached is pulled. During the upward stroke of the piston, the valve mounted on it is closed whereas the lower valve is opened. This causes water to be drawn into the pump body. 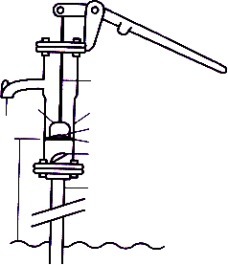 When the arm is raised again, the rod descends with the piston whose valve is opened, whereas the lower valve is closed again under the weight of the water. The water thus flows above the piston. Then when the arm is lowered again, the rod pulls the piston upwards. The valve mounted on the piston closes again and water is pumped to the surface. At the same time, during its upward stroke, the piston draws water from the well in the lower part of the cylinder, as the lower valve is opened. This thus completes the cycle. pumped water is abrasive or muddy. They work down to a depth of 7 m and are therefore mainly used for wells with a low water level. Note : although a pump’s lift height varies from one model to another, for a given model, it also varies with altitude. 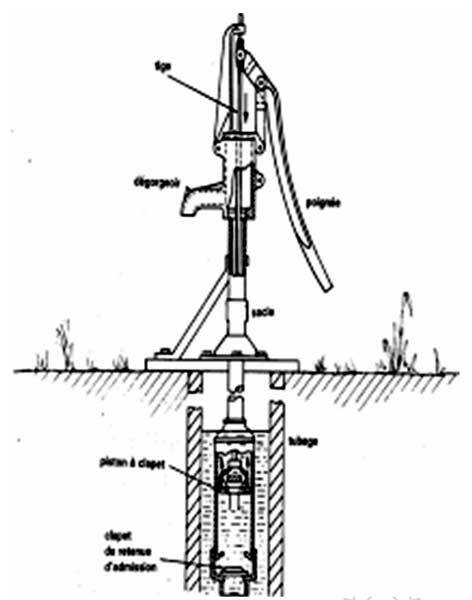 So in mountainous areas, a suction piston type hand pump can only be installed, for example, if the groundwater depth does not exceed 5 metres for a site located more than 1200 metres above sea level. Although the pump body is located below the water level, the principle of the movement of the valves and the piston is the same as in the case of suction pumps. There is no need to prime the pump, however, as the pump body is already under water. The main advantage of these pumps compared to previous ones is that they can operate at greater depths (often about 45 m but sometimes 100 or 120 m). Maintenance and repair will, however, be more difficult and costly as they require the extraction of buried parts. These pumps consist of a moving, single threaded helical rotor rotating in a fixed, double threaded helical stator. 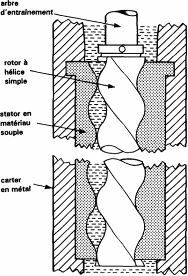 The geometry and dimensions of these two parts are such that when the rotor is inserted into the stator, a double chain of sealed cavities (cells) is formed. 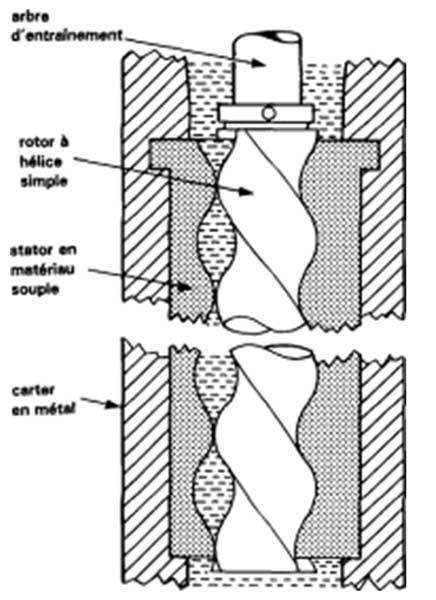 As the rotor turns within the stator, the cells move spirally along the pump axis without changing shape or volume, thereby transferring the product from the suction inlet to the discharge outlet. These relatively efficient pumps have the advantage that they do not use valves or seals which generally pose wear problems. These pumps also provide access to relatively deep groundwater (45 metres) or can be used to pump water if the required lift height is low. In addition, they can also be used for pumping dirty or abrasive water without significant risk of damage to the pump. Their maintenance and repair are, however, often somewhat complex and require the involvement of specialised technicians. Example of this type of pump : helical rotor, Monolift crank pump, which can draw water from a depth of 100m and discharge it at a height of 15 m, but the "factory" price of which is already €2,200 m for a suction depth of 60 m.
These pumps consist of a flexible sleeve with a diaphragm or balloon, placed inside a rigid cylinder located below the water level. The sleeve is inflated and deflated through the use of a hydraulic system actuated by an actuating arm. When the operator depresses the lever, the sleeve is inflated, resulting in an increase in the pressure of the water in the rigid cylinder which causes the discharge valve to open and the suction valve to close. The water is then discharged to the surface. When the operator raises the lever, the sleeve is deflated, resulting in a decrease in the pressure of the water in the rigid cylinder which causes the suction valve to close and the cylinder to be filled. These pumps can also operate at quite high depths (40 m). They provide perfect sealing, especially when compared to piston pumps and better mechanical efficiency as there is very little friction in the mechanism. They work with no problem with muddy or abrasive water. 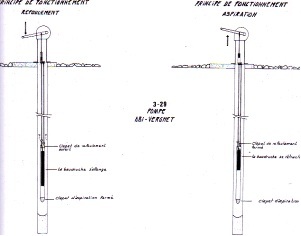 This information can be found in Fact sheet E 36 "Advantages and drawbacks of hand pumps. How should they be chosen and maintained ?" and more specifically still for the main pumps in Fact sheet No. 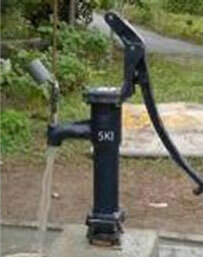 E 37 "A few examples of hand pumps". 7) Recommendation : hand pump models. How are they chosen ? If you want further information on certain common models of pumps and on how to choose a pump, we recommend you refer to fact sheet E 36 "How do you choose and maintain a hand pump ? Examples of pumps"
- AFD (Agence française de développement) : Very interesting, illustrated and wide booklet (86 pages but in french) on pumps, but also on boreholes , rural water management and water research : "Réalisation et gestion des forages équipés d’une pompe à motricité humaine en Afrique subsaharienne"
See the many videos referred to in Fact sheet E37 "Examples of fairly widespread pump models"
- BRGM (Bureau de recherches géologiques et minières du Service géologique national - Geological and mining surveys office of the national geological department) : (1983) "Means of lifting water from wells and water boreholes", 64-page book dealing with all types of pumps, with pages 1 to 12 and 40 to 44 dealing with hand pumps . - WHO-UNDP : International reference centre for community water supply. Technical publication. - IDRC (International Development Research Center) : The operation of a pump.